With oil prices depressed, exploration and production companies unearth the money-saving opportunities in water management planning. Unconventional oil and gas (UCOG) exploration and production (E&P) companies traditionally have not planned oilfield development with total water management solutions and costs in mind because past oil prices have resulted in high margins wherein water solutions and associated variances in water costs were insignificant (typically less than 10 percent with oil prices at $100/barrel). However, with the current downward spiral in oil and gas (O&G) prices, total water costs are now a significant factor for operators to improve their margins in U.S. basins/plays where they are able to operate. While operators have been successful in improving drilling and completion efficiencies and reducing the costs associated with both, overall water costs and efficiencies have not followed suit. Complicating the matter are regulatory changes and the challenges associated with securing reliable water resources in arid areas, the logistics of moving water from the source to locations, handling flowback and produced water, and evaluating the total cost of water matters in the oil patch — for example, water purchase, water transfer, water hauling, water storage, flowback and produced water treatment, and disposal (see Figure 1). To address these total water management issues, which in turn will result in significant cost savings and improved margins, is to engage in upfront water planning and use decision support tools and preliminary engineering to quickly and accurately evaluate various water solutions strategies. Operators need to spend a little now on planning and the use of technology/ engineering to significantly save capital in the near term and have known costs for the future. Traditionally, water management and associated costs have been separated between the drilling and completion (D&C) and production business units. Because of this “siloed” approach to handling water management costs, most E&P companies do not know total life cycle water management costs. For example, D&C operations are concerned only with the water management costs associated with drilling and completing wells, much of which is temporary or transitory in nature. Water supply — obtaining the necessary water pursuant to the approved D&C plan. Transportation — getting water to the pad either by pipeline or trucking. Storage — above-ground tanks or in-ground impoundments for storing water to be used in D&C operations. Treat and reuse — oilfield water treatment in mobile or fixed-based plants for reuse in completions. Other costs — right-of-ways, easements, or other land access agreements required to run transfer lines or permanent water supply pipelines and to construct water storage facilities required to support D&C operations. Separation and storage facilities — permanent facilities for separation of oil, gas, and water from the production stream and storage of fluids. Transportation — gathering systems and pipelines or trucking to transport long-term produced water to its final disposition. Treat and reuse — oilfield water treatment in mobile or fixed-based facilities for reuse in completions. Disposal – deep well injection into properly permitted and constructed Class II underground injection control (UIC) wells. Although the produced water facilities costs are capitalized, the long-term handling of produced water is an operating expense (OPEX). Since water management costs touch many different business units and types of expense, total water-related costs are many times uncertain or unknown by E&P companies. Total water costs can vary from 5 to 15 percent of the well D&C cost and were not a major concern during UCOG development with $100/barrel (bbl) oil prices. However, in the present low commodity price environment, it is critical for E&P companies to know total life cycle water management cost in order to improve operating margins. 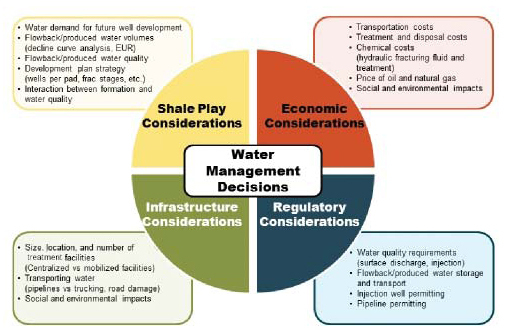 Oilfield water management decision making is challenging and has many associated considerations and components (see Figure 2). Improved water management in UCOG has been discussed in various forums ranging from the use of infrastructure to reduce costs and increase margins to managing, treating, and reusing flowback and produced water to reduce total waterrelated costs. However, a key component missing from these discussions is the use of decision support tools and strategic planning to focus front-end engineering and design (FEED) and the total water solutions costs. These discussions, as mentioned above, continue to separate the analysis of water management into the D&C business units and the production business units. However, to minimize total water costs and maximize margins, decision support tools that quickly and accurately analyze costs associated with the complete water cycle in UCOG development should be implemented in the early planning phase of play development. These tools, along with water engineering expertise, can greatly reduce the time and money required to evaluate total water solutions from traditional methods, which require significant time commitments and money. Moreover, these tools allow E&P companies to view their overall water costs (both D&C and production water) to improve efficiencies and reduce cost, thereby improving margins. By utilizing decision support tools, the operator can analyze and compare multiple water management scenarios quickly and accurately. 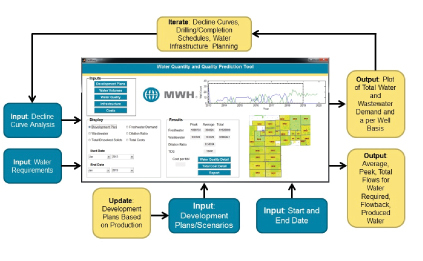 An example of an oilfield water management decision support tool that MWH has developed is included via the schematic displayed in Figure 3. Furthermore, by coupling this analysis with preliminary engineering, the operator can quickly evaluate water management costs associated with water supply, water infrastructure, treatment/reuse, and disposal alternatives, thereby eliminating risky investments and ensuring that the water solution is suited to the overall development goals. Small investments in such decision support tools can quickly and accurately accomplish these tasks and focus field planning and preliminary engineering, which is essential to continued operation in an environment of depressed and volatile oil prices. Economic analysis, including a financial model which builds on the preliminary engineering, is essential for quantifying total water management cost savings for E&P for both CAPEX and OPEX. However, any model is only as good as the input and assumptions that it is based on. MWH decision support tool results, preliminary engineering analyses, and business economic assumptions are uploaded into a financial model to evaluate the proposed holistic water management solution compared to the status quo. The status quo is the E&P current water management costs. These are important and must be collected to be able to compare existing water management costs of the proposed solutions with the current operations to analyze the total cost savings for the E&P company. At the end of the day, with the current low commodity price environment that appears to be in place for the longer term, it is critical that water management solutions achieve a significant reduction in overall water costs to be effective. It is our experience that cost savings must be in the 30 to 70 percent range to be interesting to E&P companies in the current volatile commodities price market. Utilizing the aforementioned approach, MWH has developed integrated approaches to overall water management and has analyzed water supply and conveyance infrastructure solutions in two unconventional oil and gas plays — Delaware Basin (Permian) and Greater Wattenberg (Niobrara). These examples demonstrate that through proper planning, the use of decision support tools, and preliminary engineering, E&P companies can save significantly in their water management for a minimal cost. MWH is working on a confidential project with a water rights owner in the Delaware Basin (Figure 4) to develop a groundwater resource on the owner’s property and design and build a water conveyance system to provide D&C water to E&P companies that are currently assessing a multiple horizon UCOG play adjacent to this property. In this arid region of West Texas, the E&P companies currently use a combination of trucking fresh water from small water depots, shallow wells that produce at low rates (10 to 100 gpm), or treatment and reuse flowback and produced water. These water sources are used to fill a frac pit (100 to 300,000 bbls) and once the frac pit is filled a single well can be completed. While this approach allows maximum flexibility, it is costly, inefficient, and not sustainable during field delineation or development operations, as it cannot keep up with water volumes required in the time frame needed for multiwell completions on a pad. Water supply and transportation costs associated with this current industry water solution approach were estimated at $2.68/bbl, exclusive of transfer from the frac pit to blender and on pad water management costs (IHS Vantage analysis Nov 20153). MWH’s proposed solution is to develop the groundwater resources on our client’s property by (1) installing the desired number of deeper, larger diameter wells that are able to produce 500 to 1,000 gpm, sustained and (2) designing and building an infrastructure system consisting of permanent, buried pipelines and in-ground pits to convey the groundwater at rates of 50 to 200,000 bbls/day to E&P companies in the area. MWH analyzed numerous configurations. On the basis of the initial engineering design and construction cost estimates, MWH determined that the groundwater resource can be developed on the property and a 24-mile pipeline and 600,000 bbls of storage designed and installed for a cost ranging from $1.50 to $0.70/bbl, depending on volume and term commitment that the operator is willing to agree to. With these costs, when compared to the above-cited IHS current industry average water supply and transportation costs, the operators in the area will save between $1.18 and $1.98/bbl, or 44 to 74 percent and have a reliable, large-volume water supply for D&C operations. Moreover, MWH evaluated the use of private capital to fund the project, which allows the E&P company to preserve its capital for core operations. In t he Niobrara, MWH evaluated fresh water supply and conveyance infrastructure solutions for an operator east of Greeley, CO. The focus of MWH’s evaluation was to demonstrate that through strategic planning and cost-effective preliminary engineering, the operator could reduce its current water-related completion costs by over 50 percent. 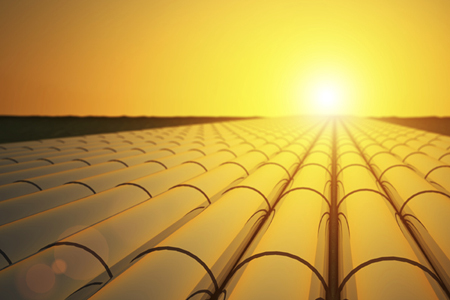 MWH evaluated numerous options for water acquisition and water infrastructure design to meet the anticipated E&P development activity. In this area of the Niobrara, operators have recently had access to inexpensive surface water as a result of overly wet conditions. However, Colorado is typically arid, and as a result reliance on current water supplies is risky, in terms of both supply and cost, for continued development. Moreover, during wintertime operations traditional water transfer can be risky because long transfers are subject to freezing. At the end of the day, with the current low commodity price environment that appears to be in place for the longer term, it is critical that water management solutions achieve a significant reduction in overall water costs to be effective. MWH’s solution included developing a plan to secure water rights for use by the operator and to convey this water via pipeline to strategic locations within the operator’s acreage. Utilizing strategic storage of water and placement of pipelines, MWH was able to provide a “screening level” analysis of the water system for evaluation by the E&P company. MWH initial engineering design and construction cost estimates for an approximate 23-mile pipeline, 600,000 bbls of in-ground storage, and groundwater wells to supply between 25 and 100,000 bbls/day ranged from $1.00 to $0.30/bbl, depending on volume and term commitment. Costs did not include transfer off the pipeline or from the in-ground storage to the pad or water costs. Comparing these costs to costs for traditional conveyance and storage methods in the greater Wattenberg area of $1.65/bbl, MWH was able to demonstrate to the E&P company that it would save between $0.65 and $1.35/bbl, or 40 to 80 percent. Moreover, as with the Delaware project, MWH evaluated the use of private capital to fund the project so the client could preserve its capital for core operations and incorporate the costs for the water solution in its drilling and completion costs. In the current market of continued low commodity prices, it is critical that costs are reduced to improve operating margins and profitability for E&P companies. One innovative avenue for those companies to achieve improved profitability is by reducing total water management costs associated with UCOG development. Total water management cost reduction was not a driver 18 months ago when oil prices were in the $100/bbl range, as operating margins were being driven by the revenue side of the equation and water management costs were a smaller percentage of the total well D&C costs. By employing holistic water management solutions that include decision support tools, such as MWH has developed, to better plan and forecast E&P life cycle water management costs, provide preliminary engineering analysis, and perform financial modeling, E&P companies can greatly reduce water-related costs associated with UCOG development. On the basis of current U.S. UCOG water management projects that we are pursuing, MWH has demonstrated cost savings of 30 to 70-plus percent on D&C water management costs. In addition, future acceptance by E&P companies of treatment and reuse of flowback and produced water has the potential to provide reduced water management costs for both D&C (water supply) and production (water disposal) operations. This technique has not been widely used due to treatment costs and availability of fresh water for fracs. Less than 5 percent of flowback and produced water is treated for reuse in the industry. If this practice becomes accepted by operators, it could reduce total water management costs (completions and production) and provide sustainable frac water during full field development and the “well factory” approach. 2. Adapted from Shaffer, Devin L, et al. “Desalination and Reuse of High-Salinity Shale Gas Produced Water: Drivers, Technologies, and Future Directions.” Environmental science & technology 47.17 (2013):9569-9583. 3. Russell Fontaine, P.E. 2015. 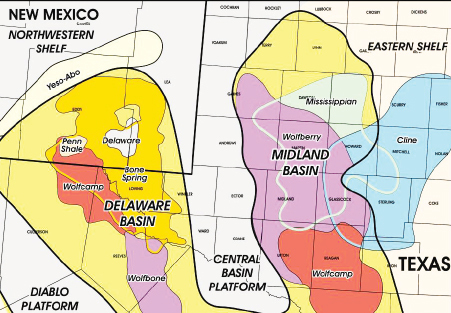 IHS Vantage Analyses of Unconventional Type Well Costs, Delaware Basin, Bone Spring, November 20, 2015. Jeffrey A. Anderson, PG, has more than 30 years’ experience solving oilfield water management problems and developing petroleum hydrocarbons. As MWH Global’ s Upstream O&G Sector leader, he provides holistic water management solutions for oil and gas operators across the globe. William H. Fronczak, Esq., PE, has over 25 years of experience involving water matters, including eight years as an attorney and seven years as the chief of water supply for the State of Colorado Division of Water Resources. As MWH Global’s Oil and Gas Business Development Director, he provides the company strategic leadership to successfully develop total water solutions for the oil and gas industry. Stephen A. Goodwin, PhD, specializes in water management and reuse for unconventional oil and gas development. At MWH he developed mFlowPlan, a water management software tool that allows operators to better plan water management and reuse strategies to reduce cost and increase planning efficiency.